A short boat trip across the river Tigris takes you from Iraq into northern Syria. Both sides of this frontier are controlled by the Kurds, who have forged their own path through the country's brutal civil war, between the opposition and the regime. Further south, the fighters of Islamic State (IS) have erased the border between Syria and Iraq, proclaiming their Caliphate. This war is redrawing the map of the region. As IS have carved out their territory, so have the Kurds. The two sides meet at a place called Jezaa, where the rolling hills of the north give way to the flat, dusty plain of the desert. A Kurdish commander points to a small town shimmering on the horizon in the midday heat: it is controlled by IS, he says. There are clashes here almost daily, between IS fighters and the Syrian Kurdish "People's Protection Units", also known as "YPG". The YPG is an offshoot of the Kurdistan Workers' Party (PKK), the Turkish-Kurdish guerrilla group labelled a terrorist organisation by the US and the EU. Around a third of the Syrian Kurdish force is made up of women. On the front lines they fight alongside the men, taking the same risks and facing the same dangers. When they see a woman with a gun, they're so afraid they begin to shake. "Women are the bravest fighters," says Diren, taking refuge from the scorching heat in the cool of an underground bunker. She and three comrades are having lunch: flatbread, cheese and watermelon. Many of the fighters, like Diren, 19, are still teenagers. "We're not scared of anything," she says. "We'll fight to the last. We'd rather blow ourselves up than be captured by IS." Like the followers of the Islamic State, most Kurds are Sunni Muslims. But that is where the similarities end. Diren says that, to the fanatics of IS, a female fighter is "haram", anathema: a disturbing and scary sight. "When they see a woman with a gun, they're so afraid they begin to shake. They portray themselves as tough guys to the world. But when they see us with our guns they run away. They see a woman as just a small thing. But one of our women is worth a hundred of their men." The Kurds have been battling Islamic State in this part of northern Syria for more than two years. Unlike the Iraqis, they have been relatively successful in consolidating their territory, without the help of US airstrikes. Asia Abdulla is co-chair of the Democratic Union Party (PYD), the dominant political party in Kurdish-controlled Syria. Like almost all officials here, a large portrait of the jailed PKK leader Abdullah Ocalan hangs in her office. In their fight against IS, she says, the Kurds are supported by a majority of the local population, including Arabs and Christians. But she admits they could use some outside help. "Islamic State is a big threat for the whole Middle East and all of the Syrian people. We are doing most of the fighting, and we need more support from regional powers." In the deserted villages around the front line, the only sign of life is the barrel of a tank peeping out between the mud houses. Most of the civilian population has left. The only people remaining are here to fight. A lone figure appears in a doorway. His face is covered in a scarf and he is holding a Kalashnikov rifle. His name, he says, is Abu Bandar Hadi. The terrifying speed of Islamic State's expansion has come in large part thanks to its ability to draw support from local Sunni tribes. Mr Hadi says that IS has split his community. "Half of the people around here are with IS. They opened their gates to them. They were our neighbours, our families, until they joined Islamic State." The Kurds play down the extent of the role played by foreigners in their battle with IS. "Most of the fighters we catch are locals", says Sores Xani, a member of the Asayish, Kurdish Intelligence. "The foreign fighters all wear suicide belts. When we capture them they blow themselves up." 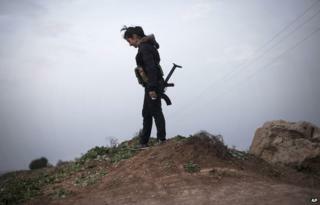 The Kurds of northern Syria are in an existential fight. The country's brutal civil war has given them the opportunity to wrest control over some of the territory they claim from the regime in Damascus. But the frontiers of their long-dreamed-of state clash with those of the Caliphate proclaimed by Islamic State. And they know they will not be able to defeat this fanatically brutal movement on their own.